1st August sees the introduction of the 200 Espio 170SL, a trim, sleek-designed aluminium bodied compact camera with a 4.5x telephoto zoom. Within its compact dimensions, this new Espio incorporates a versatile 38-170mm lens and a host of advanced functions and user-friendly features, allowing the user to swiftly and effortlessly handle a wide variety of subjects and situations. 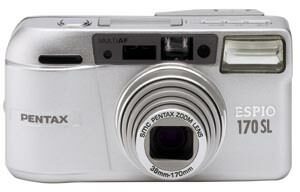 The Espio 170SL incorporates a newly developed SMC Pentax 38-170mm zoom. Its extra-wide focal length range makes it ideal for a wide variety of subjects - from landscapes to tightly cropped snapshots of distant figures. The lens incorporates a glass-moulded aspherical element and a plastic aspherical element, ensuring high-quality images, and the new four-step optical design means that the lens retracts into the body, contributing to the reduction of the overall size. Its zoom macro capability allows the user to take close-up images at 120cm away at the 170mm telephoto end for a maximum magnification of 0.15x. Measuring just 111.5mm wide, 60mm high and 47.5mm thick and weighing 200grams, the Espio 170SL is the world's smallest in the 170mm zoom compact category making it extremely portable. This compact body is the result of many break through Pentax technologies - most notably, the newly designed four-step zooming mechanism used for the 38-170mm zoom lens. Additionally, the entire body is encased in an aluminium housing to give the camera a fashionable, elegant look. The Espio 170SL's sophisticated multi-pattern metering system offers precise exposure control in a wide range of situations. When it detects backlighting conditions, it automatically compensates to brighten the subject. Under extremely poor lighting or backlighting situations, it activates the built auto zoom flash to provide extra illumination on the subject. The Espio 170SL's passive autofocus system ensures pinpoint focus on the subject even at long distances or through a window. The five-point wide focus frame keeps the subject in focus - whether positioned off centre or when two subjects are at opposite edges of the image. The user can switch to spot AF mode to avoid focusing on unwanted elements in the foreground or to infinity-landscape mode to fix the focus at infinity for capturing distant scenery. The camera's metering system detects extremely low light or backlight situations and automatically activates flash to provide fill-in illumination while adjusting the angle of coverage in proportion to the selected focal length. It also has a red-eye reduction mode, flash-off, daylight sync, slow-shutter sync and bulb sync. The Espio 170SL's viewfinder makes framing easier by automatically adjusting the size of its image area and the width of the AF frame in proportion to the selected focal length. It also indicates the close-distance compensation frame when shooting close-ups. There's also a dioptre adjustment of -3.0 to +1.0m. The panorama mode can be selected for any frame with a quick twist of the panorama lever to capture spectacular landscapes or group shots. In addition, the viewfinder automatically switches to the panorama frame to show the image area. The large LCD panel provides the user with a full range of information on the camera's operation status at a quick glance and automatically illuminates in the dark. The electronic self-timer delays the shutter release by 10 seconds and an optional remote controller offers a three second delay. When the Espio 170SL is left unused for three minutes with power on, the zoom lens retracts to the shortest wide-angle position to protect it from damage and the power turns off to conserve the battery. The Espio 170SL Date camera is also available and automatically imprints the date or day and time of shooting onto the corner of the photograph. The position of date imprinting is automatically adjusted when the panorama mode is selected. The blank mode is available when date imprinting is not desired.